Our Taobao product of the week is an outdoor solar water heater. This super convenient idea that you can take with you on your next camping trip or even to the beach. You just need to add water into the bag, put it in the sun for a couple of hours and than you will have 20L of hot water to use for a shower. This is an inexpensive environmentally friendly way to enjoy a nice, hot outdoor shower. This outdoor solar water heater is like a hot water bottle that can hold up to 20L of water. It is 60cm x 40cm and weighs approximately 420g. 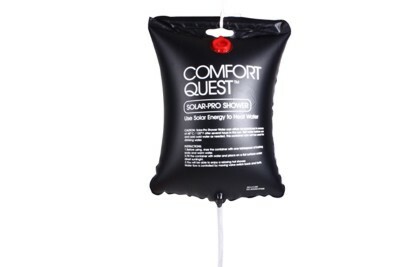 The basic concept is that the black PVC bag filled with water will absorb the solar heat and provide you with enough hot water for an 8 minute shower. In 3 hours the water temperature can rise from 15℃ to over 45℃. If the sun is very strong the temperature can reach 48℃ or even more, so you should test the temperature before using and add a little cold water if it feels too hot. Once you have hot water you just need to tie the bag up on a tree or any type of holder and than open the red water plug to start enjoying your hot outdoor shower. This Taobao seller has a wide selection of outdoor sporting and camping equipment in their online store. If you are looking for walking sticks, back packs, hiking boots or other similar products than check out all the other items from this online Taobao shop. If you are interested in purchasing this outdoor solar water heater than you can find find out more about it by clicking here and visiting Taobao right now.